Russell Shaw is a veteran journalist and author, as well as an observer of political affairs in Washington DC of many years. 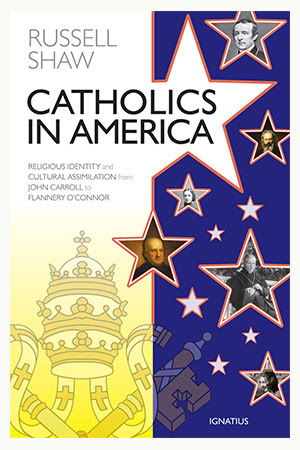 His newest book, “Catholics in America: Religious Identity and Cultural Assimilation from John Carroll to Flannery O'Connor,” is a collection of profiles of significant personalities of American history who lived as Catholics. Among the these are familiar figures such as President John F. Kennedy and Governor Al Smith, and converts such as Orestes Brownson and Elizabeth Ann Seton, as well as activists and writers such as Dorothy Day and Flannery O’Connor. In an exclusive interview with Spero News, Shaw reflected on the significance of these Americans in the story that they lived as Catholics within a larger social context that was by turns hostile or much too inviting. How each of these Catholics lived their lives serves as an answer to the perennial question: “Is it possible to be a good Catholic and a good American?” How this question has been answered and is being answered is of interest to both Catholics and non-Catholics. Shaw is a convert to the Catholic Church, as were Brownson and Seton, the latter of which has been canonized as a saint. Shaw noted the growing hostility shown in the United States towards traditional religion, as well as the drop-off in religious practice as symptoms of the milieu in which Catholics now live. The resulting “loss of identity” among Catholics, he said, is the source of many of the problems within American Catholicism. He mentioned particularly the diminishing participation in the “sacramental life of the Church,” as well as Catholics’ “political behavior” that appears to correspond more closely to secular politics. As for Catholic higher education, Shaw said that many educators have sought to advance their academic careers through accommodation to the secular culture rather than serving as faithful witnesses to their Church. Shaw has worked in the past as chief spokesman for the National Conference of Catholic Bishops/United States Catholic Conference, and later for the Knights of Columbus. He is the author of more than twenty books besides his newly released “Catholics in America.” Among them is “Our Sunday Visitor’s Encyclopedia of Catholic Doctrine,” for which he served as editor, while he is the author of “Church and State,” “To Hunt, To Shoot, To Entertain: Clericalism and the Catholic Laity,” “Understanding Your Rights,” and “Papal Primacy in the Third Millennium.” He has written hundreds of articles in publications such as The Washington Times, L’Osservatore Romano, America, Crisis, Catholic World Report, and The National Catholic Reporter, among others.